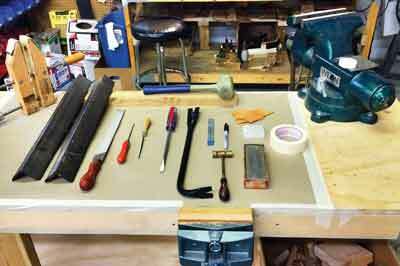 Let's put the disassembly and cleaning of a backsaw into proper perspective: who hasn't disassembled a hand plane early into one's foray down the hand tool world's proverbial slippery slope? Not that much to it, right? But, in the two images above, compare the inventory of hand plane parts on the right to the far simpler anatomy of a disassembled backsaw on the left - here you have only a handle, plate, saw back and fasteners, see? So let's stop treating saw disassembly as a mystical practice hailing from the realm of Merlin's black arts and get on with it. 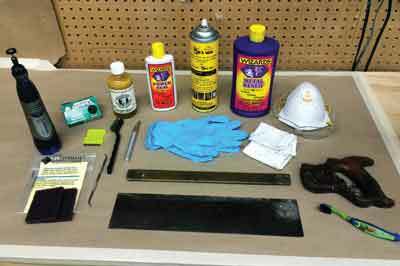 Most likely, the modest array of tools you'll need are already in your workshop. The photo here on the left shows what we typically use at the Bad Axe workshop. These are common items you'll either already have, or can easily buy. You don't need a particularly large vice, such as the Wilton with the 200mm jaws from my workshop - something far more modest will suffice. Remove the handle first. Doing so can present a challenge, particularly if the fasteners are locked tight and your screwdriver serves only to spin them around without releasing, so let's discuss how to get our frozen nuts off - our Canadian friends in the frozen north assure me this is a common malady. Drill a 20mm hole in the upper jaw of a wooden clamp for screwdriver access, and because leather is your friend when it comes to tool maintenance, glue the inside faces of the clamp with some cheap deer hide, which is available at craft stores and on eBay. Secure the handle tightly in the clamp and ensure the business end of the saw bolt is exposed within the access hole. Now unscrew it. Easy, see? Leather and tight compression works every time. Now let's remove the saw back. 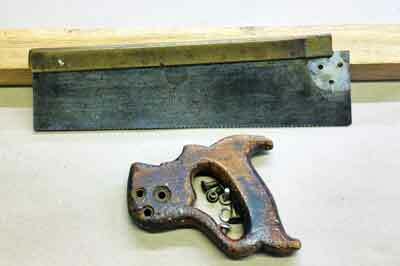 But first, we have to understand saw back technology. Until 20 years ago, all backsaws were made with the traditional folded saw back - the thick rib of folded brass or carbon steel metal sprung tightly onto the thin plate of a backsaw. Unlike handsaws, backsaw plates are deliberately thin for making furniture-grade joinery cuts and the saw back keeps the plate rigid. 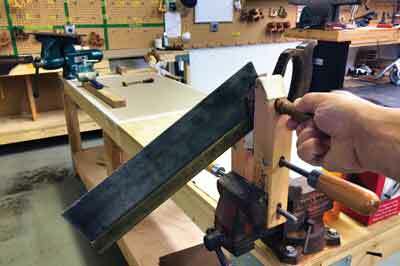 When interest in hand tools renewed during the mid-90s, sawmakers adopted a more production-friendly process by milling a slit along the underside of a piece of brass bar stock and gluing the plate in place. While this is a perfectly serviceable method, one must never attempt to remove the saw back on a new saw using this method of attachment, or else you'll ruin the plate. The photo here tells the story. As for lifting the saw back, it's always a good idea to apply a penetrating oil along the underside of the sawback and let it work into the metal overnight; this will prevent the softer metal of the saw back from bowing when you lift it afterwards. When you're ready, cinch the plate in between leather-lined angle-irons - simple enough to make with deer hide and 3M spray adhesive - which are in turn clamped by the vice. Leave about 6mm of the plate exposed at the toe end of the plate/back assembly and rest the heel end of the saw back onto the surface of the angle iron, with your vice clamping the plate quite tightly. 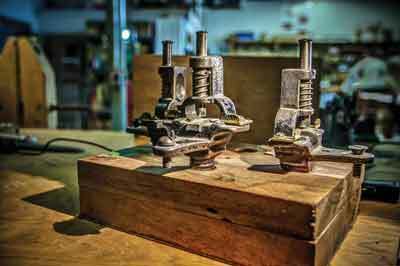 If you have a small vice, use C-clamps to cinch up the ends of your angle iron. 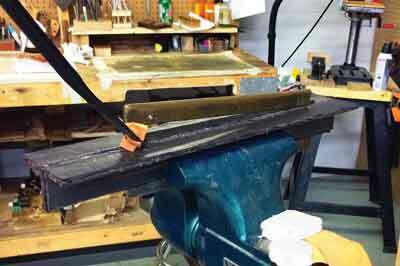 Now jam the fork of your crowbar underneath the leading edge of the plate where it enters into the saw back. Again, leather is your friend at this step. Stick a small square of it inside the fork to protect the underside of the saw back. Lift the back while pushing inward with the crowbar. 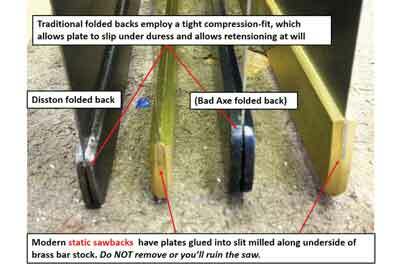 Do NOT lever the saw back by pushing down with the crowbar -you'll dent and mar the underside of the saw back. Rather, put your shoulder into the equation and press your crowbar upwards. See the saw back shift upward from the spine of the plate? Don't get in a rush at this point by attempting to complete this process with just one lift. 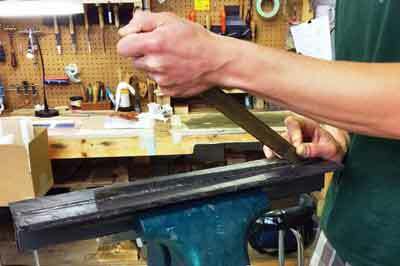 Release the jaws of your vice and reposition the plate like before, then repeat the process. It usually takes about three lifts, maybe four, until you have raised the saw back sufficiently off the spine to the point where you can pull off the rest by hand. Now you have completely separated the handle, back and fasteners apart from one another - you're ready to clean. and saw back. Take care that you don't wipe out the etch on your plate if it still exists. Your goal is to simply clean and make your plate smooth, NOT to turn it into a mirror. Use your dental pick and gently clean and buff out your fasteners - there is no need to make them brilliant, but rather to achieve a dull gleam you'd find on a very well-protected antique. As for the wood, all that is required is to gently clean and rejuvenate. 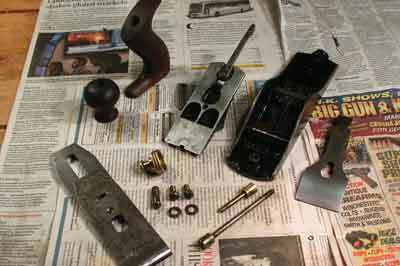 If you have a handle repair or new horns to graft onto the handle â€“ which will be explained in the next article â€“ then hold off on treating the wood, but simply sand and/or scrape away the grime and paint splatters.